For those of you who haven't been to this great event here is the low down. Customers donate their loved but unwanted needlepoint and knitting supplies and projects. We price them really low and have a fun afternoon of selling. You never know what you will discover at this sale. All the money from this great event goes to Young and Healthy in Pasadena. Click on the link to read about the great work that Young and Healthy does for children in the San Gabriel Valley. We will be accepting your unwanted treasures; knitting yarn, books, accessories, canvases, etc. until a week before the event. We have a great start so far. Lots of great items have already been donated. So clean out your closets and bring it to the shop by October 19th. Remember, no credit cards on sale day. Cash or check only. 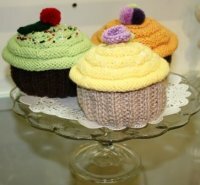 Margaret Williams, our new knitting teacher, will be teaching you how to knit these adorable Cupcake beanies. The class dates are November 8, 15, and 22 from 10:30 to Noon. The class fee is $45.00 plus your supplies. You can pick up a supply list at the shop. See you by October 19th to donate your unwanted items. See you October 27th for Trash to Treasure.